Hill has a stake in seeing the spaces around the buildings changed or used. Given this, it is fitting that he considers the spaces around the building, recasting them as spaces of interaction and activity. 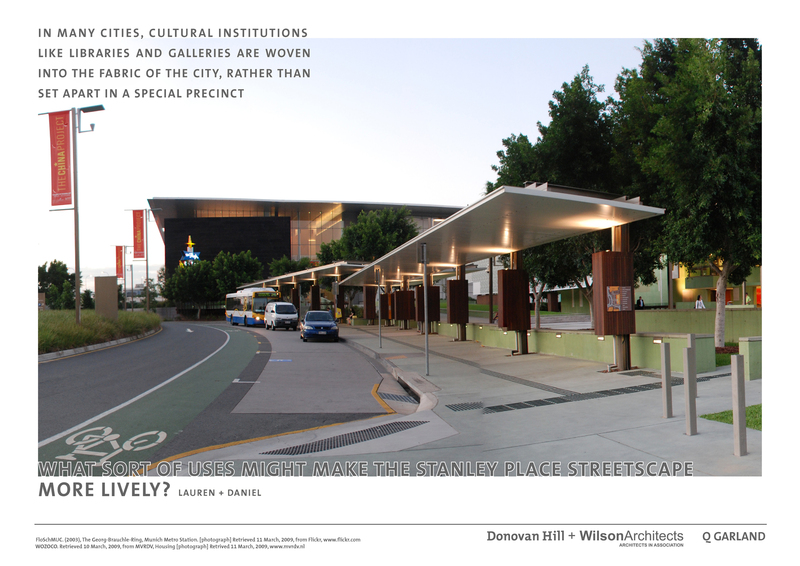 The series of 20 ‘before and after’ images comprising Q-Garland, presented as an installation in the formal and open space of the Millennium Arts Precinct during Brisbane’s Ideas Festival, also sought to raise awareness among visitors and audiences about the importance of public space. 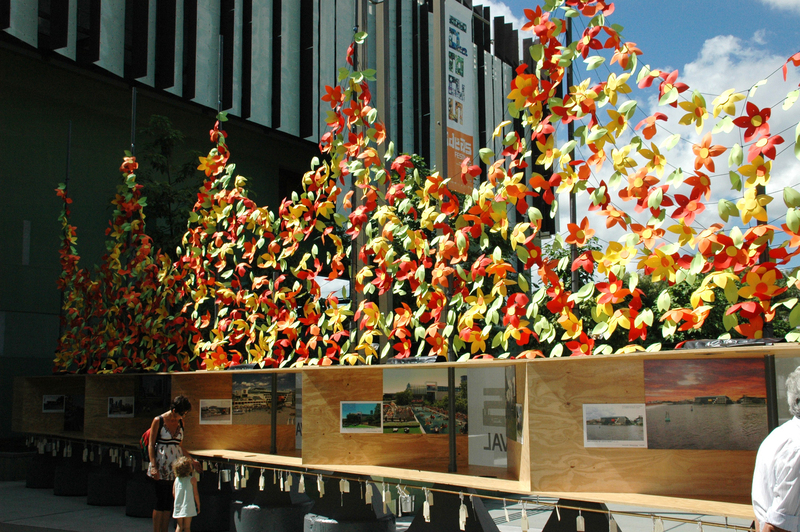 The installation also featured 3000 paper flowers, which symbolised the importance of gathering in public space, perhaps also the importance of cultivating an awareness of the civic realm. The project was also presented, perhaps performed, at Pecha Kucha in Brisbane. 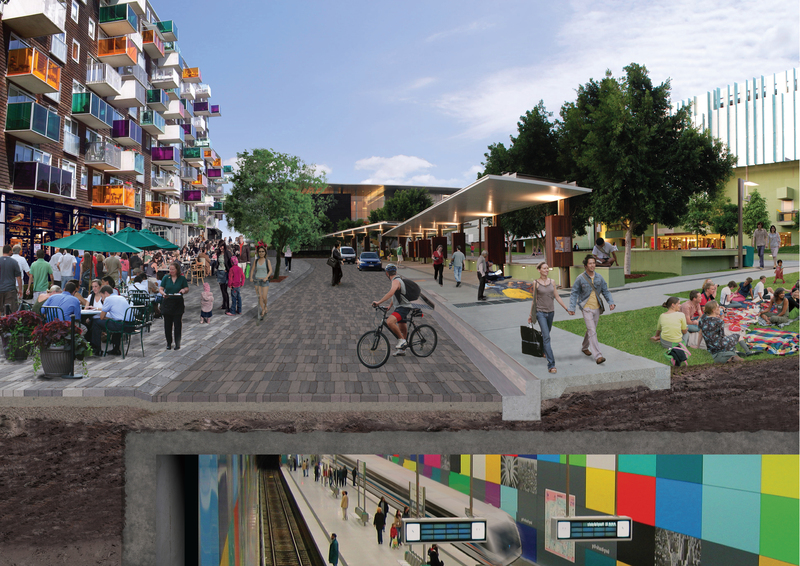 The types of scenarios presented by Q-Garland included child-friendly spaces, urban agriculture, more compact development, including residences, and river leisure. Most of the scenarios involved ‘giving back’ urban space in various ways especially where it seemed underappreciated or used. There’s a recombinant logic in this project that splits and mashes normative urban typologies. Members of the public were invited to indicate their preferred scenarios and make comments at the installation, during which volunteer attendants engaged in conversations to survey the audience about the importance of public space and gather intelligence about community attitudes. During a session at the Unlimited Asia Pacific Design Triennial, Hill reported that there is readiness in the community for urban agriculture and openness to different ways of doing the city to bring life and use back to its public spaces. While the idea of the architects or artists impression is not new, the project points to the failure of more formal planning and design processes to engage communities and publics in potentiating our city and its public space. Engaging people through creative scenarios in a forum about ideas and sharing is more open ended than the normative urban development and planning consultations. In casting an opportunistic eye over the landscape, these speculations and provocations sparked conversations for exploring alternatives – that most seductive of questions, ‘what if …?’ The most resounding ‘what if…?’ is perhaps the assertion that the precinct, and city generally, can be more of an activated and productive ‘people place’ and less of a formal park setting for buildings. PLACING is a critical and cultural exploration of place, writing place and place writing, comprised of multiple writing projects. It is a platform for writings and publications addressing the intersection of cultural and urban life with an eye for the future. This project explores emerging and changing ideas about urban environments with a particular emphasis on the role artists, designers, planners, architects and other urbanists can play as changemakers and futureshapers in the face of significant urban pressures. PLACEBLOG is a writing and research space produced as part of the placing project. REPORT |Projects: Fieldworking and Long Time, No See? Visitors to this site are welcome and encouraged to make comments on these posts. However, please note that comments are moderated for the sole purpose of keeping spam and inappropriate or offensive material off the blog.